The Hoatzin is a strange bird, indeed! It looks like it was put together by a committee. But the way it looks isn't the only thing that sets this bird apart. The Hoatzin is strictly a leaf-eater, filling its stomach with leaves, and then resting and digesting for long periods. Chicks have vestigial claws on their wings, which they lose when they grow older. Be sure to see the video. Make your next trip an eco-tour, and see what you can see! Imagine paddling slowly along the edge of a forested oxbow lake in eastern Ecuador. Suddenly, an ungainly bird the size of a chicken takes off from an overhanging shrub and flaps awkwardly into the next clump of bushes. 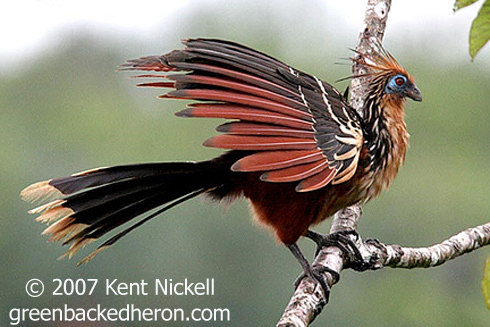 It’s a Hoatzin (pronounced HWAT-zin), a relative of the cuckoos and one of the strangest birds in the world. With scraggly crest and long tail, it looks like a bird put together by a committee. Bright blue facial skin and piercing red eyes add to its exotic appearance. But that’s not the only odd thing about this bird. The Hoatzin is a vegetarian, filling its stomach with leaves, and then resting and digesting for long periods. The wheezy calls of a group sound more like a troupe of monkeys than a flock of birds. If you were to watch closely, you’d see more of them, as they’re highly social. They nest over the water, and when a chick is disturbed by a predator, it drops out of the nest with a splash and climbs back into the vegetation, using vestigial claws on its wings. These claws are unique in the bird world. You can see Hoatzins almost anywhere along the tributaries of the Amazon River. Or get a look at one – including one of those chicks with claws on its wings – on our website, BirdNote.org. Call of the Hoatzin 117903 provided by The Macaulay Library at the Cornell Lab of Ornithology, Ithaca, New York, recorded by D.W. Finch. Canoe paddling recorded by C. Peterson, Ontario.